In 1956, a 22-year-old Leonard Cohen published a small volume of poetry that he had penned between the ages of 15 and 20, titled Let Us Compare Mythologies. Evocative and compelling, it was a remarkably assured debut for such a young mind, inspired by the visionary Spanish poet and playwright Federico García Lorca, who was executed by a fascist firing squad during the Spanish civil war. 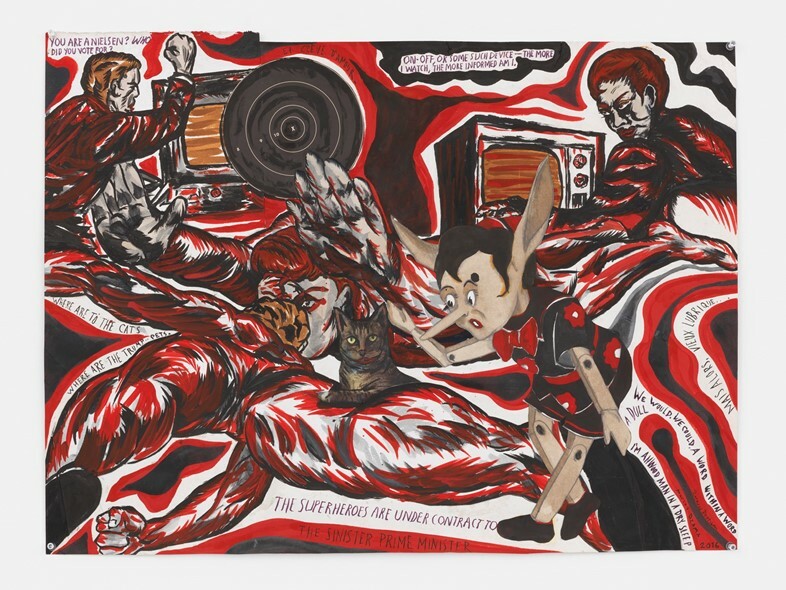 60 years later, the significance of Cohen’s verses continues to play on the minds of contemporary artists Marcel Dzama and Raymond Pettibon, whose forthcoming collaborative exhibition at The Upper Room at David Zwirner London takes the same name. Encouraged by Lucas Zwirner – the charismatic editor of the gallery’s publishing imprint, David Zwirner Books – the duo evolved their practice through their own irreverent take on the famed surrealist method, ‘exquisite corpse’. 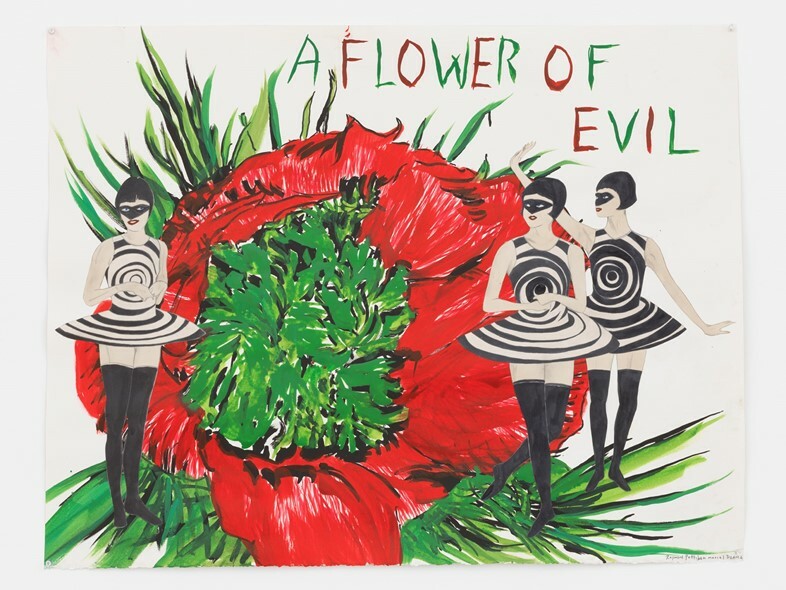 As Dzama notes, “essentially, one of us starts a series of drawings that are then completed by the other.” So successful was their union and speedy output that it culminated in both a sell-out zine and accompanying 2015 exhibition at David Zwirner New York, called Forgetting the Hand. In the same spirit as Forgetting the Hand, their latest project, Let Us Compare Mythologies interweaves arbitrary fragments of text with various entities (human or otherwise) amid a defiant sea of colour and climactic markings that throb with energy. 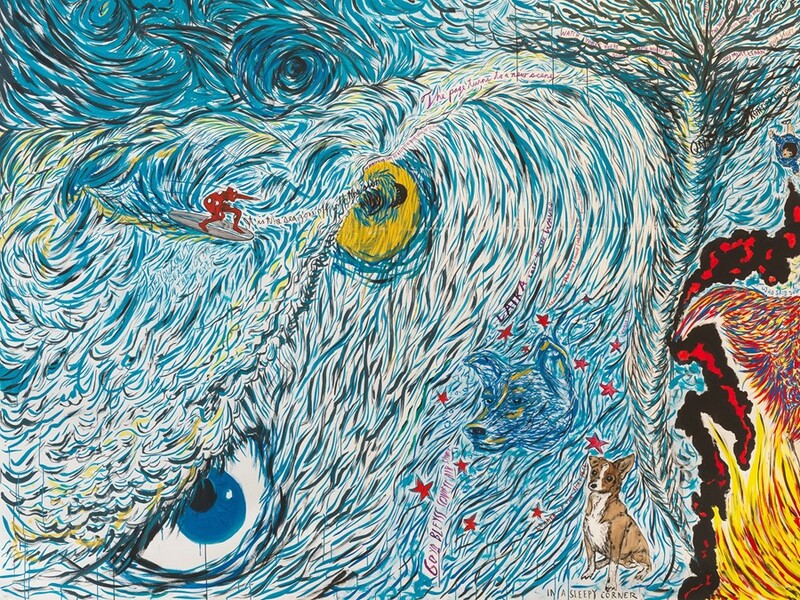 “We were listening to Leonard Cohen’s The Future (1992), which has this kind of apocalyptic theme,” says Dzama of the work’s inception. “And with the American election, and Trump, and the actual weather being at a record high, it all came together – a natural apocalypse.” Below, in this exclusive first look at the drawings that feature in the upcoming zine, Dzama reveals the concept and realisation of his favourite spreads. "This heavy red drawing with Pinocchio walking through it and a cat in the middle came about because my son had a bunch of magazines with him while I was working, and he had cut out that cat, so I just thought I had to use it [laughs]. It also plays on the theme of the Jump campaign, a dictator preaching to an audience. We added in 'the sinister prime minister' after the news of Brexit broke out." "One of my favourite works is the one that features a large flower and 'the flower people'. I've been working on a short film – a campy comedy – with that title and the drawing becomes part of it. It's a weird take on the actress Amy Sedaris. She's so good, she's actually playing me in it! [laughs] There's also an actor playing Raymond Pettibon. I was going to try and finish the film for the show, but I ended up making more drawings instead. Raymond actually plays David Zwirner too." 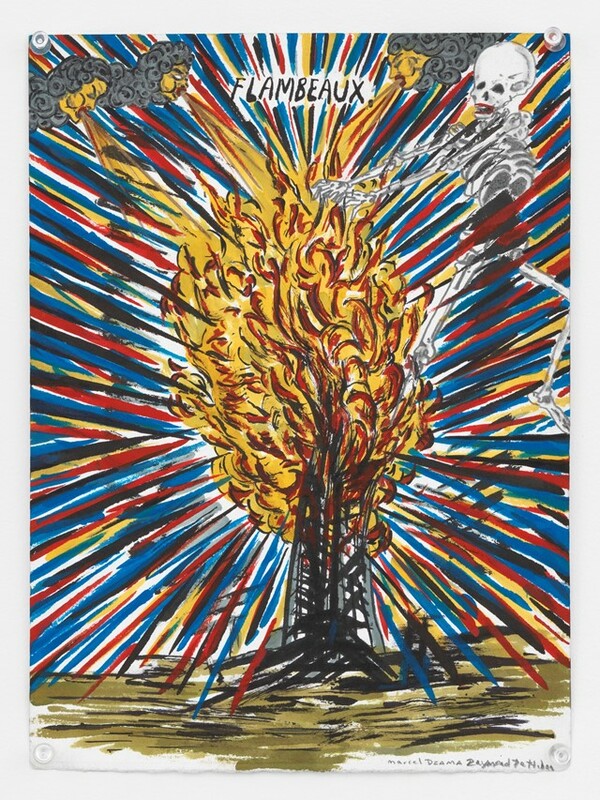 "This drawing of the oil tower and the huge explosion in the sky with these big flames and a skeleton actually became the centerpiece of the larger drawings. It's about control, and it's very important to me. 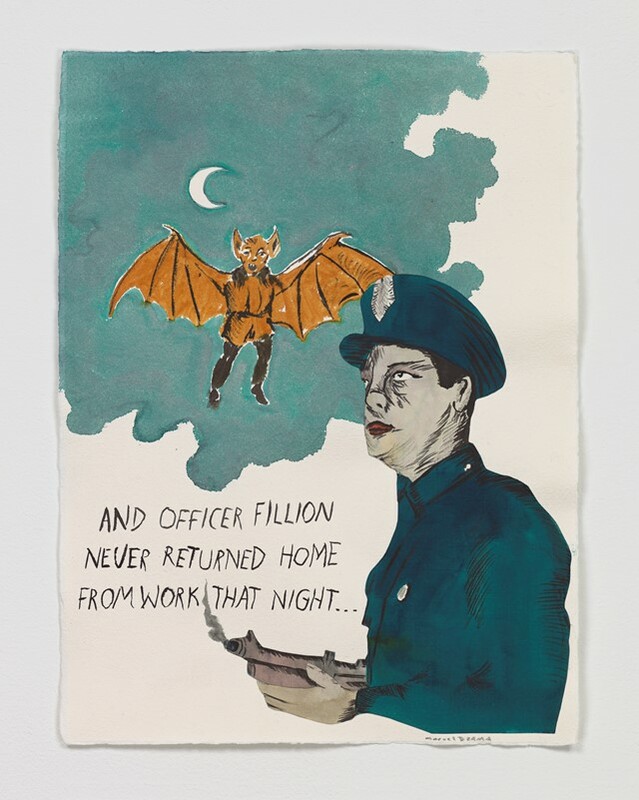 We created the opposing image [Bat Boy, 2016, seen above] around the time of the terrible police killings of African-American men over here – that was very much on everyone's mind. I mean it was just so terrible. So, there are two tragedies over one spread and I think they feed off each other." "This drawing of a three-eyed woman was actually inspired by a painting by Francis Picabia [French avant-garde painter, poet and typographist]. In fact, there a quite a few references to Picabia throughout because I became quite obsessed with him." At a hollow yellow sign. 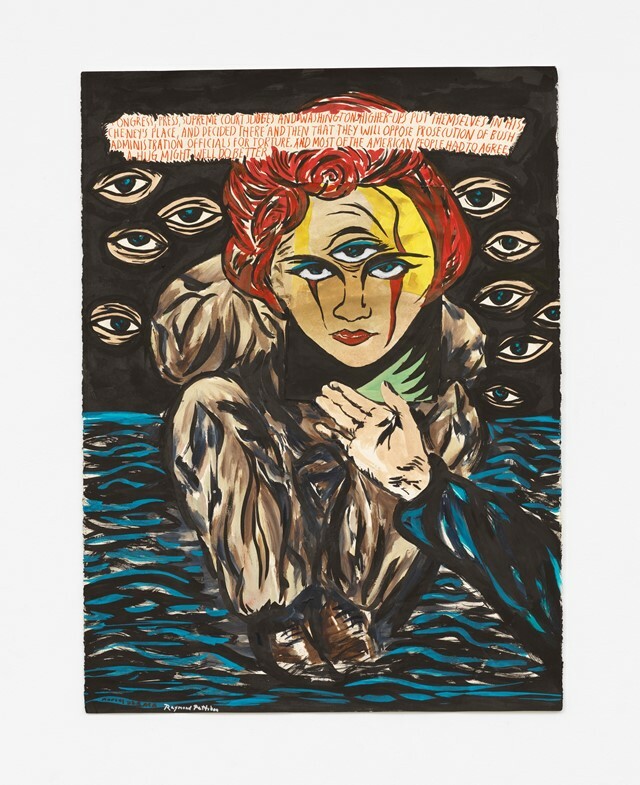 Let Us Compare Mythologies by Marcel Dzama and Raymond Pettibon is on view at The Upper Room at David Zwirner London from October 5 – November 12, 2016. The exhibition's accompanying zine is published by David Zwirner Books. With special thanks to David Zwirner Gallery.